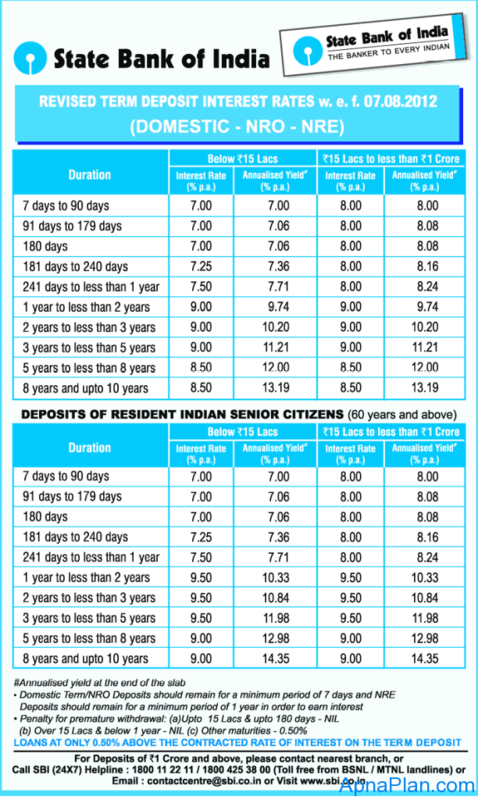 India’s largest bank State Bank of India (SBI) has reduced its NRE/NRO, Senior Citizen, Domestic Term Deposit Rates by 0.25% for certain tenures from August 07, 2012. Below are the revised rates. Domestic Term and NRO Deposits should remain for a minimum period of 7 days and NRE Deposits should remain for a minimum period of 1 year in order to earn interest. No penalty for premature withdrawal upto 180 days and 0.5% for other maturities. If I deposit 10 lakhs in a bank means after the maturity of the fixed deposit will they deduct tax from only the interest or will they deduct some money from the deposited 10 lakhs also? The tax is only deducted from the interest you earned and not on the original principal amount.